Articles and reviews on used and new automobiles featuring the Pontiac G6, Hyundai Veracruz, used Honda Civics, 2000 Honda Civic, 2004 Honda Civic and 2006 Used Honda Civic. If Among the Best, ranks as an A, that means, The Rest, must rank as a D since there is no fifth lowest position in the rankings. 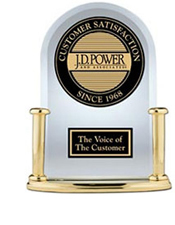 Perhaps, JD Power and Associates doesn’t want to offend anyone too badly? Among the Top-10 Car Insurance companies, there are none that rank worse than a C or, About Average. Do we really want to talk about those? I love the convenience of liquid car wax. Turtle Wax Ice wipes on creamy and smooth; dries to a dull haze then wipes off to a brilliant, shine. Having completed a review of the best car waxes last year, I preferred the Turtle Wax Super Hard Shell over Mothers because it seemed to provider a thicker, hard shell just as the name implies. Of course, the other reason I loved the original Turtle Wax is for the dirt-cheap price. Because Turtle Wax Ice is nearly twice as expensive as the Super Hard Shell product, it better bet twice as good. The makers of Ice proclaim that it is easy to wipe on yet provides a shine and protection that will last for many, many months. That’s a pretty bold claim, isn’t it? The difficulty in reviewing car wax is that not all cars are the same. The color, tint and shade of each car makes a difference. It is also true that different car metals behave differently with different types of wax. I’m pretty comfortable agreeing with Turtle Wax on the first part of their claim. The Ice T-468 Liquid Car Polish is a breeze to apply to the car and even after drying in a fairly hot garage that day, it came off very shiny and smooth without taking much, if any muscle, to get off the extra wax residue. This is not true with the Turtle Wax Super Hard Shell. Even though it’s a liquid, the Super Hard Shell took some enormous work to get the residue off the hood of my silver, BMW 540i.. The extra elbow grease and effort is well worth it, however because it provides a long last shine. See picture which was taken while washing the car a week after applying the Super Hard Shell Turtle Wax. It remains to be seen how well the Turtle Wax Ice T-468 holds up compared to the Super Hard Shell. But what to other users of Ice say about this premium wax? Over 74 users rated Ice by Turtle Wax an average of 4 stars. Many of them complained that the shine didn’t last as long or the coat did not seem as thick as other traditional, cheaper waxes like Super Hard Shell which is half the price. Those who did a more thorough Turtle Wax Ice Review, seemed to be pickier about what they’re looking for in a car wax and went into great detail about what’s to like and not like about Turtle Wax Ice. Auto Assure is a specific brand of specific brand of insurance that works much like an extended auto warranty. The real difference with Auto Assure and other extended auto warranty companies is that they will cover the repair bills on really old cars for up to 200,000 miles. I’ve looked at an extended auto warranty before, but only the kind that extend the manufacturers car warranty on cars that are still fairly new. Car assurance is a whole new ball game. I’ve never been much in favor of extended warranties of any kind, but a radio commercial for Auto Assure made me think twice. To explain, I’ll talk about the extended auto warranty in general; then I will discuss the specific Auto Assurance brand and how it might benefit me using my own, old, old car as an example. My old, 1997 BMW 540i has 158,000 miles on it. You might ask why I would keep such an old car, knowing that Bimmer owners are prime suspects for extremely high-cost repairs in the first place? My dilemma is that I cannot afford to replace this old, BMW with a new car that is anywhere as close to being as satisfying to drive. The other problem is that once you start putting money into your old car, it’s hard to stop. For instance; radiator and transmission replacement, valve covers, seals, wind-shield and the list goes on. Makes you start wondering if car assurance is for you. The right time to buy car assurance would have been three years ago when I bought the car with 143,000 miles on it. So, the answer is, yes, I am definitely a good candidate for car assurance assuming I plan on keeping the car another three years. Truthfully, I didn’t even know car assurance existed for such an old car until I heard the radio ad for Auto Assure. Should I consider Auto Assure? The basic powertrain plan, ofcourse, includes the most basic, yet most expensive things that can fail on your car: Engine, Transmission, Cooling and Axle. The Plus adds fuel system, electrical, electronics, air conditioning, seals, gaskets, transfer units. The Platinum includes anything and everything under the sun and the Gold Component only emits internet and blue tooth from the coverage. Surprisingly, when I called Auto Assure they didn’t even bother to talk to me about the different plans. They immediately went for the Gold. A young sounding man answered the phone and asked me for the details of my car. I gave him the model and mileage and mentioned to him that I had just replaced the transmission and radiator and some of the additional work that had been done. He told me that he needed to check with his supervisor and see if he could get my car approved for Auto Assure car assurance and transferred me. I spoke with his supervisor for a few minutes who explained to me that I would I was approved and would get a $400 discount. I was transferred back to the first agent who began using some high-pressure techniques that I didn’t particularly care for. He explained that the $400 discount offer had to be acted upon now – that is, not today, but during the call. I told him that I don’t operate that way. I don’t make financial decisions without talking to my spouse about it; then sleeping on the idea for one night. I politely refused his offer. So, let’s see what I turned down. How Much Does Auto Assure Cost? Here is the breakdown of the Auto Assure offer I got for my Bimmer: $295.00 down payment (over the phone NOW) – Then 18 subsequent, monthly payments of $179.00 each. That comes to about $3,517, total cost. Coverage lasts for 5 years. In hindsight, I would have saved about $3700 had I taken advantage of a plan like this 3 years ago. I paid over $3500 for my transmission and about $2700 in additional repairs in the last 3 years. You can read about my transmission repair experience here: Avoid Engine and Transmission World. Here is another not-so-good experience you can read about for my radiator repair: Avoid 5601 Garage in Arvada. I’ve had some bad luck associated with my BMW and repairs and was not about to take a risk on Auto Assure without fully checking them out. How can you know they are actually good for the money when something goes wrong? The sales agent explained to me that not only every repair of the car fully covered, but it includes towing insurance as well. This sounds good, but do they deliver the good when you need the goods? I did some Google searches for Auto Assure and car assurance companies and was not able to find much in the way of any confidence building testimonials or A+ BBB ratings. Even without the high-pressure sales tactics, it would be unlikely that I would take a chance on a company that I know so little about. Having written an article about Extended Home Warranties, I learned that the greatest cause for dissatisfaction is getting paid for the work when you need it. Extended warranties need to provide 100% confidence and peace of mid. Without that, you have no idea if you’re simply throwing your money away. Before I got off the phone with the high-pressure agent, he did give me another offer: $179.00 Down and $139.00 per month for 24 months. That still adds up to the same amount: $3,515. I told him, no thanks. Despite the relatively negative review on Auto Assure, I have nothing against an extended car warranty for an old car that I plan on keeping. I can see where a program like this would be very beneficial for people who love their old cars and want to continue driving and enjoying them for a very long time. The key is to do your research and home work and choose an extended auto warranty company with credentials, positive reviews and a track record of happy customers. Auto Assure was not that company. Do you have Auto Assure? I’ve bought a lot of inexpensive hand tools, parts and accessories from Harbor Freight, knowing that for the low price I didn’t have much to lose. For the most part, the tools at Harbor Freight have held up pretty well. Don’t be fooled by the name, Pittsburgh. These tools are built in China, not America. Is that not a brilliant marketing ploy, using the name of a familiar, U.S steel city to make you think you’re getting the kind of quality, old-fashioned tools your Grandfather used? Regardless, the Pittsburgh sockets and wrenches seem to be well made. The one exception is the 3/8″ Torque Wrench which I never could get to work. I guess sometimes you really do get what you pay for. So on to the Harbor Freight floor jack, which is one of the more expensive tools I’ve purchased from this store. This could be considered a small risk. The price, which is normally $89.00 was on sale for $59.00, so I took a chance and bought it. I don’t have a lot of experience with floor jacks, but I’ve been very happy with this purchase so far. It is light-weight as advertised, but feels very solid. The wheels roll very nicely on my driveway and the aluminum handle, which is removable, screws in and out easily. Hydraulic floor jacks do use fluid, but leaking was not a problem. Well, how does it work for jacking up a car? Can a Cheap Hydraulic Floor Jack Lift a BMW? At 3750 pounds my BMW 540i, really tests the limit of the 1.5 weight capacity. I did seem to discover its weight limit one time while attempting to lift up the entire front end which is something I wouldn’t do very often. For oil changes, it’s best to use ramps and jack stands. Changing tires and lifting one side at a time is a breeze with the Harbor Freight Floor Jack. 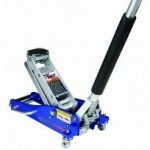 The Harbor Freight Floor Jack is a good product – my only complaint is that it can’t handle the weight of my old, Bimmer. One thing to be aware of; not all Harbor Freight Floor Jacks are created equal. I bought the blue aluminum one which is rated at 1.5 tons.